(December 19, 2004) -- A shooting occurred in the Washington Middle School neighborhood on Saturday night December 11 in the 1400 block Chestnut Ave...just hours before a group of business and neighborhood activists -- frustrated with neighborhood conditions -- held their second picnic to show solidarity with neighborhood residents. "Better Balance for Long Beach," a group recently created by LB activists representing businesses and residents, began holding neighborhood picnics last month in "14st St. Park." 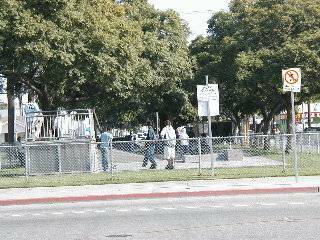 The "Park" is the former parking area for the vanished Seaside Hospital, now a street median on which LB Parks & Rec has fenced some areas and installed playground equipment. City Hall lists it on its Parks & Rec web pages as "14th St. Playground" among LB parks...but with hours that aren't exactly user friendly: M-F from 2:30-4:30 p.m...and closed Saturday and Sunday. Multiple neighborhood residents at the November and December events (we attended both) described a neighborhood -- roughly one mile north of LB Civic Center -- where residents live in fear and City Hall doesn't control nuisance or illegal conduct...even on city-owned property. LBReport.com recorded their comments at the December event and transcribed salient portions below. 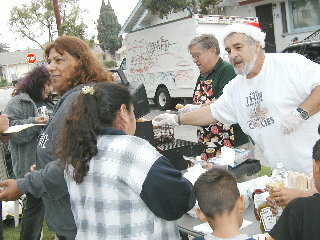 At the December picnic, we watched Linda Palacios of the Washington School Neighborhood Association (photo foreground, left) handle the crowd while Better Balance picnic co-organizer Paul de Jung (in Santa hat) cooked and dispensed hot dogs. But some of the Better Balance organizers expressed pointed personal opinions when asked (as we did). "In my view, there's the problem, right over there," said Mr. de Jung, gesturing toward Councilwoman Lowenthal (over his shoulder, at left in photo) at the November event. At the November and December events (we attended both), we heard residents describe a neighborhood where adults and children regularly witness visible drug dealing, sexual activity, charitable food and utensils left as litter while some individuals hurl verbal assaults at children on their way to school. Much of this takes place on or near the city-owned playground/street median, they said. 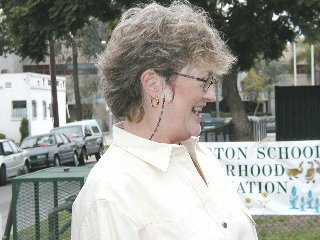 Better Balance co-organizer, Jane Kelleher, holds Councilwoman Lowenthal responsible in an area with historically low voter turnout. "Bonnie's done nothing since [the first picnic in November]," Ms. Kelleher told us at the December picnic . 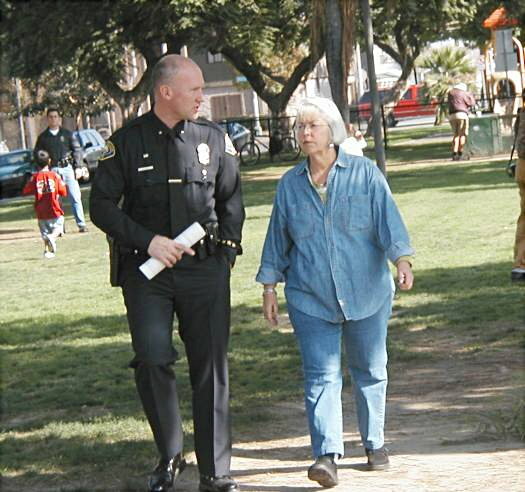 Councilwoman Lowenthal attended the November event, held a walking tour and field discussion with LBPD...and spoke with Better Balance organizers. 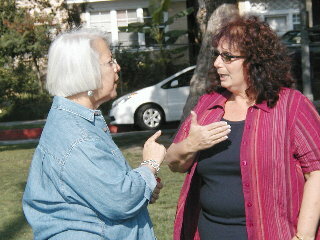 The Councilwoman and Better Balance maintain diplomatic relations despite their policy differences. 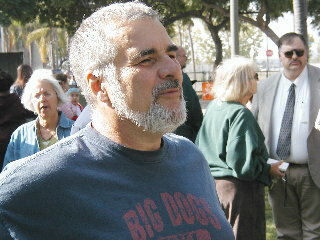 ...and co-organizer and WLB businessman Dan Berns. "I have always worked closely with the neighborhood and I'm doing so now." Pointing westward beyond the street median, she added, "I'm very excited about the fact that the city recently obtained a grant that will bring the neighborhood a brand new park just down the street near Magnolia." So why are residents telling us that City Hall lets nuisance and illegal activities take place in "14th St. Park"? "I have zero tolerance for nuisance or illegal conduct here or anywhere in this city," Councilwoman Lowenthal told us. 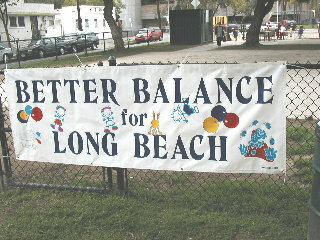 Ms. Palacios, whose neighborhood association co-sponsored the picnic with Better Balance, told LBReport.com that Councilwoman Lowenthal's office has responded when alerted to problems as they arise and has been helpful during the holiday season. "I had requested to see if she could help us with toys for our kids since Christmas is coming up, and she came through. She's going to have about 100 gifts for us," Ms. Palacios said. "That's lip service," Ms. Kelleher responded in Ms. Palacios' presence. "She has not done anything to improve this park." "Oh, as far as the park, nada," Ms. Palacios acknowledged. Ms. Kelleher continued, "We want the neighborhood to become empowered. The more times we hold a picnic, the more the mothers see that, yes, you can take your children out here, the more they're going to know that they have power that they don't think they have right now." "She needs to be told by this neighborhood that her actions are not acceptable. She's been AWOL on this issue...How many years has she been in office? How many years has this park been the antithesis of what a park should be?" Ms. Kelleher said Better Balance had its inception a few months earlier after Councilwoman Lowenthal supported a year-round homeless facility near the Magnolia Industrial area. 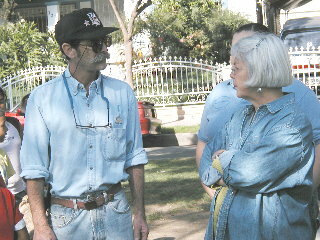 Ms. Kelleher was among the opponents; opinions among Magnolia Industrial stakeholders were mixed. 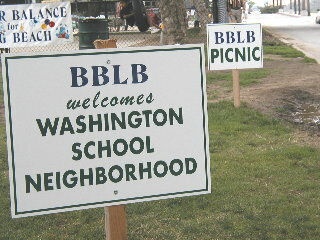 Ms. Kelleher said the picnics are a group effort involving LB activists including Ms. Greenfeld-Wisner (south Wrigley), Geoff Bennett (Magnolia Industrial area) and Carol McCafferty (Wilmore area), Jose Aguilera (Gridley district), Jack Smith (Wrigley) and Dennis Monfett and Ms. Palacios (Washington Middle School area). [Neighborhood and group descriptions for identification only]. The Better Balance picnics come as the City Council -- which oversees spending LB tax money for public health, safety and parks -- has scheduled a Dec. 21 vote on whether to declare itself LB's Redevelopment Agency Board. The legal basis for Redevelopment is the elimination of blight. The 14th St. Park area is within the Central Long Beach Redevelopment Project Area in which LB's non-elected Redevelopment Agency Board has held major land use and development powers for a number of years. LBReport.com: If you had the Mayor here, if she came here today, what would you tell her? Clean this area out. Have more public programs as to what's going on now. Involve more law enforcement..
LBReport.com: You want more cops here? Yes! Yes I do...[and says neighbors feel the same way but are afraid to talk], As you can see, we're losing control here...During the night people will not come out. If they don't have milk, they'll go without milk until the morning, because all the screaming you hear, all the shootings you hear. [translated from Spanish] On Saturdays, someone brings charitable food and leaves all kinds of trash and boxes of clothes, a mess everywhere. The recipients throw food all over the park grass...They eat only a little bit and throw the rest all over and it makes our park look nasty. Walking by, there's the smell of marijuana...When we try to bring our kids to play at the park, adults in the park start yelling and cursing and using foul language, so we take our kids home. LBPD Public Information Officer Sgt. David Cannan told LBReport.com that the Dec. 11 shooting (the night before the picnic) in the 1400 block of Chestnut Ave. (within steps of "14th St. Park") took place when an armed suspect walked up to an individual standing in a courtyard and opened fire. The victim was hit, transported to a hospital and is expected to survive. On December 12, in what may or may not be a related arrest (uncertain at the time), LBPD took an armed suspect into custody four blocks north in the 1800 block of Chestnut Ave. LBPD responded to a gang fight with shots fired, arrested a suspect and recovered two guns, including an assault rifle. Also on December 12, a shooting took place a bit northeast in the 2100 block of Locust Ave. when unknown suspects shot (unclear if they walked or drove up) a male victim standing in front of a residence. That victim is expected to survive.